April 27th, 2018 (2:27 AM). April 27th, 2018 (7:13 AM). April 27th, 2018 (10:34 AM). Thanks. I love it. Will start with the first one soon. April 27th, 2018 (7:52 PM). Edited April 29th, 2018 by Suon. Now that we can cross water, we can go on a new mission. I retrace my steps to Rock Tunnel and surf to a new area of the Ruins of Alph. Here, I catch our final companion, PTITSA the Natu (Ptitsa is Russian - in Latin letters - for bird. Next, I go all the way back to New Bark, surf east to the Tohjo Falls, and pick up a Moon Stone. Now, KOROL is a true King! Back to the main story. At the lighthouse I find out that Jasmin needs help with a sick Pok�mon, so no gym challenge yet. So I jump on ZUB's back and surf toward Cianwood. On the way, PTITSA evolves into Xatu and OVTSA into Ampharos. I arrive in Cianwood, surf back to pick up HM Strength in Olivine, and back again to Cianwood (every time!!!). It's PTITSA and OVTSA that get me my fifth badge, and now I can Fly. I don't forget to pick up the SecretPotion for a change, and go back to Olivine. I don't think I can beat Jasmine yet, too underleveled, so I go to Mahogany and the Lake of Rage. I beat the red Gyarados, meet Lance, beat Team Rocket, and beat Pryce. Also, I pick up a Sludge Bomb, only to discover that KOROL can't learn it... ?? 6 badges, and number 7 coming. Jasmine is easy now, with OGON and ZUB, now a Feraligatr, having the type advantage. I go through all the shenanigans at Radio Tower in Goldenrod, where I beat RIVAL for the 4th time, and can now go to Blackthorn for my final badge. This is the first real challenge of the game. My team has been very balanced so far, but an Ice Punch might not be enough. I start again with the Whitney technique, and KOROVA beats the first 2 Dragonairs. She rerolls against the 3rd, but too much is too much. ZUB's Ice Punch finishes it. Kingdra is a pain, as always. ZUB bites and heatbutts, and then faints. OVTSA finishes with his Thunder Punch. Elm gives me a Masterball and now I can go to the League. I catch a Goldeen to ride waterfalls with and make it through VR intact, even beating RIVAL without a scratch. After grinding everybody to lvl 42 (you know, the answer...) I challenge the E4. Electric and Fire are the main ingredients here. OVTSA and OGON have no troubles beating Will's Psychics. OGON uses Flamethrower for Ariados and Forretress. KOROL uses Earthquake for Mukesh and KOROVA uses Rollout for both Venomoth and Crobat. I start of with PTITSA against Hitmontop. Fly doesn't seem to work due to Detect, but Night Shade and Future Sight do the trick, since Hitmontop barely hurts me. Hitmonchan is also food for PTITSA, but Machamp finishes her with a Rock Slide. KOROL finishes both Machamp and Hitmonlee, and ZUB is too strong for Onix. KOROL starts by double kicking her Umbreon. PTITSA then uses Fly against Vileplume. Houndoom is fast and damages ZUB quite a bit, but Surf is still strong enough. Same story with Murkrow and OVTSA's Thunder Punch. KOROVA is last, to use Shadow Ball for Gengar. I decide to start with KOROVA. I give her an X Accuracy and start rolling. She beats Gyarados and two lvl47 Dragonites, before losing against lvl50 Dragonite. ZUB takes over, and finishes with Ice Punch. Also Aerodactyl is toast after a Surf/Ice Punch combo, but Charizard manages to finish ZUB with a Hyper Beam (so no healing) and <10 HP left. Any of my team can finish it now, and it's PTITSA that uses the last move, Thief. Now, I'm heading off to explore Kanto and find the current World Champion. April 28th, 2018 (2:38 AM). So, I started with the very first one and picked up Charmander as my starter. Won 4 gym badges and caught a caterpie ,oddish and gastly on the way. Right now I'm on my way to my 5th badge. *All Pokemon are in the order they were obtained. April 28th, 2018 (6:03 AM). Edited April 29th, 2018 by Suon. Did not expect it of course. Here's a quick summary of what happened. I made it to Kanto and challenged all the gyms there. Except for Blue, they were all walk-in-the-parks. Blue had the level advantage, which made it a bit harder, but still nothing to fear. Oak let me go to Mt Silver, and that's where the real grinding begun. I rebattle the E4 multiple times, I stroll for hours through the grasslands and caves of Mt. Silver and in the end, I'm sick of it. He starts of with Pikachu, I with KOROL. Pikachu is faster, but his Charm fails. KOROL uses Earthquake, ohko. He brings out Espeon, I swap KOROL for KOROVA. He uses Reflect and since he's male, I can use Attract. Now, I use one X Attack, and when he hits with Psychic, I heal. Mostly, he's infatuated though, and I finish it with Shadow Ball. He chooses Snorlax, I swap KOROL back. I'm faster, and use Toxic. He Amnesia. After one X Attack I start Double Kicking, until his HP is over halfway down. He then KOs me with Body Slam. I send KOROVA back in and use Attract to possibly prevent damage. It works. Snorlax is infatuated twice when I've started my Rollout. He faints from poisoning. I still have 3 rolls left, only becoming stronger, so I don't swap out when he chooses Venusaur. He uses Sunny Day and one Solar beam, but can't handle a lvl 3 and 4 Rollout and faints. Although my HP is almost down, I don't swap when Charizard comes into play. Who know, maybe he uses a status move. Unfortunately, no. Charizard is faster and Flamethrower KOs KOROVA, after a fantastic streak. I send out ZUB, and throw Surfs at Charizard, while he keeps using Flamethrower. I win, so Red is down to his last pocket monster. Red sends out Blastoise. I decide to keep ZUB with ~1/3HP in the game and use Slash for some damage. I could even slash a second time, since Blastoise uses Rain Dance first, but after that ZUB faints. Time for OVTSA to finish the job. Blastoise uses a by rain strengthened Surf first, which deals quite some damage, but a well aimed Thunderpunch is enough to win the match. April 29th, 2018 (10:33 AM). Well, this will be quick update... I started Trio-Species on Black few hours ago and played on autopilot while doing other things... Fast forward few hours to the the present time and here we are, with another challenge completed! I don't have much to say about it, I don't think something extraordinary happened - it was smooth, fun run. My team was Emboar, Musharna and Krookodile. I chose them because their coverage of each other so only problematic Pok�mon were Water-Types, which I beat with pure force. May 1st, 2018 (5:24 AM). May 1st, 2018 (7:40 AM). May 1st, 2018 (8:35 AM). Also, one question. For the Scramble Challenge, what team must I use? May 1st, 2018 (11:37 AM). The common tactic is to ask here for the team or use some kind of random Pok�mon team generator to get one by yourself. May 1st, 2018 (12:03 PM). In that case, could I ask you a team for me, please? May 1st, 2018 (4:40 PM). If it's okay with Zemanahrad that I give it, here's what I rolled. May 1st, 2018 (4:50 PM). May 2nd, 2018 (4:02 PM). Edited May 3rd, 2018 by SorveteQuente. 2) I wanted a Murkrow for this. Unfortunately, playing in Diamond prevents me from using a lot of Pok�mon that the character I chose owns, but I will find a way to get around it. Anyways, to the actual game: I played for a few hours today and got past the first and second gyms, as well as Mars and Jupiter's first battles, naturally. Nothing really excited happened, it was relatively easy. Also, can anyone figure out what was the character chosen? May 3rd, 2018 (8:16 AM). May 3rd, 2018 (11:05 AM). Edited May 3rd, 2018 by SorveteQuente. Today I played a lot, and got all the way to Route 216 with 6 badges now yay! Starting off in Hearthome, I swept through Barry's team and got to Solaceon Town with no problem at all. On the way I picked up HM04 from the cemetery tower thing. It's weird though that they give you Strength this early when you only get to use it after 6 badges. Route 210 had a lot of trainers, which made POL evolve into Gastrodon. In Veilstone, I went straight to the gym only to hear Dawn complaining about Team Galactic at the door. The puzzle was quite challenging I (The only gym puzzle I actually like in D/P so far) and so was Maylene. Fortunately, POL was able to take Lucario out when MON (Murkrow) fainted for the Machoke. 2) He fainted to a wild Ponyta. Arriving in Pastoria City, I entered Great Marsh to get a new team member, the female Marill which I named TRISH. Crasher Wake was a bit challenging because of Gyarados but Gastrodon and Torterra worked together and took it out easily. Quagsire triplets and Floatzel had no chance. After sweeping through Barry again (surprised he still has a Starly), I chase a Team Galactic Grunt down Route 213 when he finally decided to battle me with his Glameow. Humiliating defeats aside, I met Cynthia staring at two Guys in Valor Lakefront as she gave me an important mission: Cure the mysterious Psyduck gang in Route 210 and deliver the Old Charm to Old Lady. Frustrating battles in fog later, I delivered the thing to Old Lady, she gave me HM03 (yay POL). A sinister encounter with Cyrus made me get out of this Town and Fly straight to Hearthome test my math skills. As I learned 5 + 3 + 7 is 15, I battled Fantina and easily won with MON (though I started the battle with POL to get Surf's debut). I battled Barry again (this time with Staravia finally, though the Platinum one has a Staraptor at this point) and trained a little at Iron Island with Riley, a new friend. Went to the gym sweeping everything with POL, and Byron was not different, easy battle. Oh, and Zemanahrad got it right, I chose Paul as my character. May 3rd, 2018 (1:27 PM). May 4th, 2018 (2:46 AM). Edited May 4th, 2018 by viper8890. Sorry for the time taken for the update. I completed the Kanto Highest Stat Sp. Atk Challenge on firered. And I didn't thought it before but if the nick given is to be used as the ingame name,I just realised it right now. I'll use it from the next challenge. For this challenge, I had used my regular ingame name. May 4th, 2018 (4:52 AM). I started a new adventure, this time the first on generation 3. Now, I moved to a new place in the outback to work for a few months, and have very limited internet and little time, but whenever I can (and want...), I'll try to play a bit and update regularly. Like before, I choose my starter by checking my Trainer Card. 1-3= Fire type, 4-6= Grass type, 7-9= Water type and 0= 2nd last number. My ID is 20388, so I pick Mudkip. I like the foreign nouns as nicknames so far, and choose Spanish nouns this time. Say hi to BARRO (Spanish for mud). Now, the a is to link types together. So my next Pokemon should be water or ground (only after BARRO evolves). I puzzle a bit with the Pokedex to figure out my upcoming team and I think I've found an interesting combination. On route 102 i catch a Lotad and call her FUENTE (Spanish for fountain). In the Petalburg Woods I catch a Shroomish and call her SETA (Spanish for mushroom). I just beat Norman, the fifth gym, and had absolutely zero problems so far. 2, maybe even 3 Pokemon will join my team later in the run, and I know who, but that will just have to wait a bit longer. May 4th, 2018 (5:17 AM). Edited May 4th, 2018 by Janp. And I didn't thought it before but if the nick given is to be used as the ingame name,I just realised it right now. I'll use it from the next challenge. For this challenge, I had used my regular ingame name. It's okay to use whatever name you want in-game. The name you posted in the sign-up is mostly for the list of challengers the 1st post. May 4th, 2018 (5:38 AM). I'm really curious to see what Pok�mon you'll use since you've already beat the fifth gym with only 3 members. Good luck on the run. May 4th, 2018 (7:03 AM). Edited May 4th, 2018 by Lrachelr5. This looks good, for Hoenn and Kalos can I please get my scramble teams? 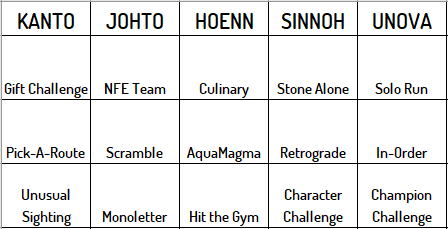 And could I get a different challenge instead of the in order one for Sinnoh? May 4th, 2018 (10:01 AM). This looks good, for Hoenn and Kalos can I please get my scramble teams? May 4th, 2018 (11:05 AM). Edited May 5th, 2018 by Lrachelr5. Okay, can I just get a reroll for Gliscor? I can't get the Razor Fang pre E4, and I don't know if I would be allowed to trade over a Razor Fang for evolutionary means.